American-Made Flag North Dakota: What Days Should You Fly Your American Flag Made In America? 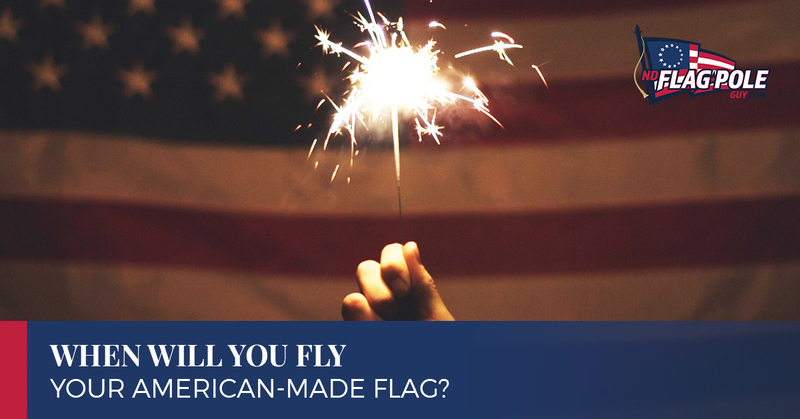 In our most recent blog, we went through the first half of the year and detailed the days on which many of our customers choose to fly their American-made flags (though some of them will be flying them every day once they get their flag pole installation performed). While everyone knows to fly their flags on Memorial Day (last Monday in May) and Flag Day (June 14), we also detailed some of the lesser-known holidays that might warrant raising the Stars and Stripes on your flag pole. For instance, don’t forget Armed Forces Day (third Saturday in May) and Inauguration Day (January 20th, but only every four years). July 4 – If a person only remembers to put their flag out once a year, Independence Day is probably it. And in many ways it makes sense — how would you celebrate your country if the country doesn’t exist in the first place! No matter how you decide to celebrate Independence Day in America, we hope you’ll join us in raising your US flag high. July 27 – While the Korean War is sometimes called The Forgotten War, that doesn’t mean that you have to forget it. One of the best things you can do on this day is to raise your flag on the flagpole to honor the signing of the Korean Armistice Agreement in 1953, officially ending armed hostilities. 1st Monday In September – Labor Day is a federal holiday that celebrates the workers who have contributed to the prosperity and well-being of our country, a day for the common man. While it was first recognized as a federal holiday in 1894, thirty states (out of 44 at the time) already had some form of Labor Day as a state holiday. September 11 – Patriot Day was first held on September 11, 2002, the first anniversary of the attacks on the World Trade Center and the Pentagon. It is held on September 11 of each year, and flags are to be flown at half-staff to remember the Americans killed on that day. September 17 – Constitution Day, formally known as “Citizenship Day” and currently known as “Constitution Day and Citizenship Day,” is celebrated on the anniversary of the signing of the United States Constitution. September 18 – The Air Force was founded on September 18, 1947, and on that day became its own branch of the military. September 18 is the most commonly celebrated day, though it’s important to remember that August 1 was celebrated as Air Force Day for the first two years of the branch’s existence. 3rd Friday in September – There’s no better day to fly your POW/MIA flag than on the 3rd Friday in September, a day to honor those who were prisoners of war and those who are still missing in action. The flag is flown at full staff, as long as it is not higher or larger than the American flag. October 13 / October 27 – October 27 has been Navy Day in the United States since 1922, selected because it was the birthday of Theodore Roosevelt. While Armed Forces Day was supposed to replace the days to recognize each branch of the US armed forces, the individual holidays have endured due to servicemen and veterans from those branches expressing their interest in honoring each branch. Interestingly, further historical research has shown that the Continental Navy during the Revolutionary War was actually formed on October 13. While this is the new official day of Navy Day, most people still observe it on October 27. November 10 – Like the other days honoring branches of the military, Marine Corp Day was supposed to be absorbed into Armed Forces Day. That might be the official situation, but Marines are more than happy to still fly their flag on November 10. November 10 is the anniversary of the day in 1775 when the Continental Marines were formed…which makes the Marines older than the country itself. November 11 – Veterans Day, formerly called Armistice Day until 1953, is perhaps the only day on which more flags fly than on Independence Day. Veterans Day is the day on which we celebrate all veterans, as opposed to Memorial Day when we remember those who lost their lives in battle. Veterans Day is a day of celebration, as opposed to the day of mourning that Memorial Day is supposed to be. Because Veterans Day is celebratory, the American flag is to be flown at full staff. November 2, 1889 – If you’re here at NDFlagPoleGuy.com, there’s a really good chance that you’re in North Dakota. While every state can observe its admission to the Union on its anniversary, we thought you’d like to know the exact date that you can fly the ND flag to honor your state. If you’re looking for a North Dakota flag for sale, we have them. 4th Thursday in November – Thanksgiving is a national holiday and one of the days on which it is proper to fly the American flag. It is a day to give thanks for the good fortune our country has experienced over the centuries. December 7 – On December 7, 1941, Japan attacked the United States at Pearl Harbor, Hawaii, killing 2,403 United States Citizens. You might be surprised to learn that Pearl Harbor Day, officially known as National Pearl Harbor Remembrance Day, has only been a holiday since 1994. Flags should be flown at half-staff on this day. December 25 – Whether you are religious or not, there’s no doubt that Christmas Day is a big day for many Americans. There’s also no doubt that it’s a federal holiday, so feel free to raise your American flag! Fly Your Flag With Pride! Even if you fly your flag every day, we hope you’ve enjoyed reading about the flag-flying days in this and in our previous blog. If nothing else, this has been an excellent way to find out why there are more flags out on some days than on others, especially when it comes to military flags. If you’re looking for a high-quality American flag made in America, we’ve got what you’re looking for and can handle your flag pole installation in North Dakota as well. Contact us today to schedule an appointment!